Sponsored by government departments and driven forward by the three blue light emergency services, the most extensive and ambitious joint training programme in emergency service history has been designed and executed. There have been attempts to address interoperability between the emergency services in the past but none have had the buy-in and support of all the key stakeholders and the support of Government. This time we also want to ensure we really do have a process by which we can learn lessons from the past and put new practices into place. JESIP has been a successful programme; delivered on time and within budget! The key areas for improvement that JESIP has focused on included: • a lack of joint training at operational level • a lack of joint working guidance • a lack of understanding of others’ roles, responsibilities and capabilities • ineffective inter-agency communication • previous lessons/reports not acted upon. In 2013, after extensive consultation with all parties involved making compromises but progress, the JESIP Joint Doctrine was published. This guidance aimed to address the issues around communication at an operational level and better sharing of incident information, and it set out five principles for joint working (see below). This laid the foundation for JESIP, and a library of training and awareness products was produced. The joint training that has now occurred addressed the other issues of staff improving their understanding of the roles, responsibilities and capabilities of their peers. Initially, the idea of joint training, getting police, fire and ambulance staff in the same room at the same time, was met with huge amounts of scepticism and concern – it simply is not possible, was the view. However, the emergency services themselves have proved that theory wrong on a major scale. During 2014, some 10,000 priority emergency services personnel attended JESIP training courses. A further 1,600 accessed the e-learning products or attended awareness sessions. And these numbers are continuing to grow. The feedback has been excellent across the board with over 80 per cent of those attending training either very satisfied or satisfied with the course. Anyone involved in training will appreciate that this tells a very positive story. At the start, all the evidence pointed in one direction. The findings of 32 major incident reviews shaped JESIP and the feedback from staff on the ground underpinned the direction we needed to go. Train people together, get them talking, break down pre-conceived ideas and barriers and open up communication channels – then we could achieve our aim. JESIP has initiated a change in perspective amongst the blue light emergency services. An awareness that they each have very important but distinct roles when responding to incidents but that by understanding each other better, they can do even more to achieve JESIP’s main aim: working together – saving lives. But the work is not finished; we cannot all sit back and relax. 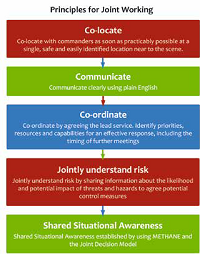 We will have only achieved real success when commanders, control room and first responder staff across all services know and work to the JESIP principles as a matter of course; when all services have aligned their local policies and procedures to JESIP; and when the use of the models for passing incident information (METHANE) and the Joint Decision Model (JDM) are used without question, no matter what the nature or scale of the incident. And this aim is not about one method being better than another; this is about doing what is best for the public we serve. The whole reason JESIP was set up was to address inconsistencies that existed. That is a big change and change is always difficult. Only with the sustained enthusiasm we have seen across the country with the support from the top down will the emergency services truly be able to say they are working together – saving lives. A key part of the programme was to provide assurance that JESIP had made a difference on the ground. We needed to show that the training that had taken place had started to have an impact. We did this through a series of small scale but live play validation exercises across the country. This culminated in the largest live play exercise taking place in Merseyside on 18 September 2014. Exercise Joint Endeavour took place over 18 hours with a complex scenario involving a train derailment, multiple collisions and building collapse. For a full report, see October’s FIRE by subscribing at www.fire-magazine.com/fire-magazine/. Around 1,000 people were involved in the exercise including representatives of other organisations including the Ministry of Defence, the local authority and British Transport Police. The aim of all of the validation exercises was to test the initial joint response of all emergency services against the JESIP principles and ways of working. While JESIP has already started making a positive impact, there is much more to do. Services now need to embed JESIP into their local policies and procedures. Opportunities for the services to train and exercise together more need to be exploited and JESIP training needs to feature in all services’ ongoing learning and development programmes. The initial phase of JESIP came to end in September 2014 but this is only the end of the beginning. JESIP has instigated change that will last beyond the end of the programme. The JESIP logo will see a slight amendment as we move from a short term programme to embedding JESIP firmly in the emergency response interoperability landscape. The “P” in JESIP will change from “Programme” to “Principles” reflecting the importance of what has been achieved so far and the belief that the joint working principles are the key to improving interoperability in the long term. Again with support of government departments and the emergency services, a small team is in place until March 2015 to further develop and crystallise legacy arrangements that will run from April 2015. What is the Legacy of JESIP? The legacy arrangements will include: ensuring training in the joint working principles reaches all appropriate staff and are built into services’ future training programmes; testing and exercising activities will incorporate testing for interoperability knowledge and skills; awareness packages will be made available for wider category 1 and 2 responders; a Tri-Service Governance board will be established to “own” interoperability in the future to ensure learning from what happens today can smoothly progress to national policy and procedural changes as and when required. To support this Tri-Service Governance Board in improving interoperability in the future, a new process of ensuring that we can truly learn lessons from the past and improve the practices of today is being established. Joint Organisational Learning (JOL) will be further developed by JESIP and launched in 2015 following a period of testing with a number of areas across the country. We need to ensure that the good work JESIP has started continues. We need to ensure services more routinely plan together, train together and test and exercise together. This is the only true way to improve interoperability. To find out more about Exercise Joint Endeavour, the Joint Doctrine and supporting resources visit www.jesip.co.uk or follow @jesip999 on Twitter.